UNITED NATIONS (Sputnik) – Russian Permanent Representative to the United Nations Vassily Nebenzia on Wednesday called on his US counterpart Nikki Haley and the US delegation at the United Nations to observe diplomatic decorum and not refer to the Russian authorities as a regime of President Vladimir Putin. During a session devoted to the UN Charter, Haley called Russia a destabilizing force in the situation in eastern Ukraine. The US diplomat added that what she called regimes of Putin, Syrian President Bashar Assad, and North Korean leader Kim Jong Un were acting unpunished on the international arena. 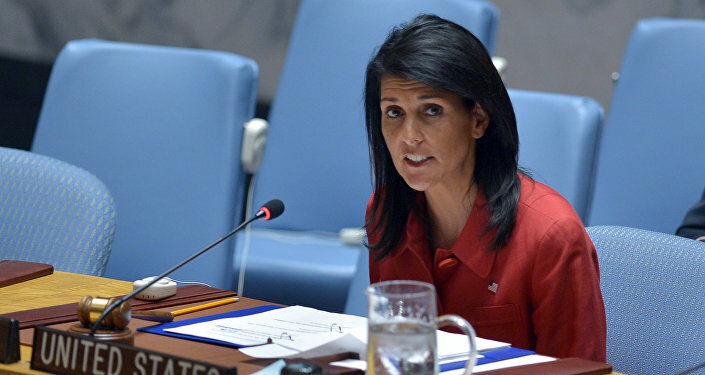 "I would like to remind permanent representative Haley – there is no "regime" in Russia, but a legally elected president and appointed government. I would like to ask the US delegation to observe at least basic diplomatic decorum in the future. By the way, there is also a legitimate government in Syria, whether you like it or not," Nebenzya said at a United Nations Security Council session. This is not the first time the US Permanent Representative to the United Nations comes under fire over professionalism issues. Last year, her tweet on North Korea caused quite a stir online. Also, earlier Haley suggested that the US was the "moral conscience of the world," saying that she would work to make the organization a tool for promoting American values. Such statement was strongly criticised by alternative news media and some foreign officials. Russian Foreign Ministry spokeswoman Maria Zakharova responded to the statement in a post on her Facebook page, saying that "The UN is a chance given to humanity to prevent new world wars, which come about as a result of an overabundance of feeling about one's own exclusivity."